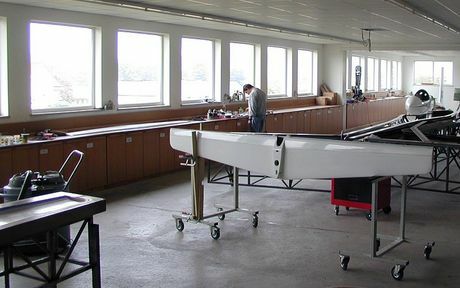 The company Binder Flugmotoren- und Flugzeugbau GmbH was founded by Walter Binder in 1979 in Ostheim vor der Röhn. Walter grew up in the High Röhn, near the famous Wassekuppe, were Gliding was born. No wonder that he became a glider pilot as early as 1966 at the age of 18. Already in 1974 he started developing retractable engines that would make him independent from winches and tow planes. As the next step he concentrated on performance optimization of his gliders. This resulted in the EB family of gliders, selflaunching high performance single- and two- seaters of the open class, that won him already two world champiships. He is still busyly perfecting his gliders, having always his old self defined goal in mind to create the best glider in the world. In July 2014 Walter Binder was awarded the OSTIV prize for his lifelong and outstanding achievements. In 1995 his nephew Oliver Binder joined him in the compony. Oliver is also a glider pilot since early youth and has earned himself a number of good rankings in competition gliding. In 2012 he became Bavarian Champion in Bayreuth. In 2012 Walter Binder layed the company in Olivers hands. The clients and partners of the company greatly appreciate Olivers expertise and experience, and last not least his service mindedness. The company has 10 also very experienced employees. The airfield of Büchig, were most of the test flying is done, is located near the company.